Profitez de l'intimité de «Amazing Grace» lorsque vous passez des vacances dans cette charmante maison de la communauté de golfs fermée du club de golf Currituck! Situé sur un cul-de-sac du côté du son, cette maison offre deux suites de maître chacune avec leur propre bain à remous. Cette maison dispose de canapés en cuir confortables dans le salon avec télévision à écran plat DVD / VHS et dispose d'une cuisine bien équipée avec de nouveaux appareils, d'un coin repas (8 personnes) et d'une demi-salle de bains. King Master Bedroom avec télévision à écran plat et accès au pont. Grenier avec bureau. Queen Master Bedroom avec accès au pont. Pyramid Bunk Bed & Twin Bedroom part Salle de bain complète avec chambre Queen avec terrasse Accès à la piscine. Buanderie et garage. À l’extérieur, installez un barbecue à gaz et profitez du soleil au bord de la piscine privée (10 'x 29') ou sur l’un des deux grands ponts. En saison, la section Magnolia Bay a une grande piscine et une pataugeoire pour les plus petits et des courts de tennis. En tant que clients du Currituck Club, une communauté fermée de premier ordre, votre famille peut utiliser ses diverses commodités, notamment un service de tram gratuit pour accéder à la plage, un service de voiturier pour la plage, un clubhouse avec restaurant sur place, une grande piscine commune avec piscine pour enfants, un centre de remise en forme et des courts pour le tennis, le basketball et le volleyball! Des activités pour les enfants sont proposées pendant l’été et des sentiers de promenade et de vélo sont proposés. Les golfeurs de la famille peuvent faire des réservations pour jouer sur le parcours de 18 trous, aménagé dans tout le complexe, avec vue sur l'océan et le son. La piscine privée est ouverte de la mi-mai à la mi-octobre. Great property, loved the trolley. Only drawback was traffic through Duck and Southern Shores. Peggy C.Where do you live? This house was perfect for our group of 5 adults and 5 teens. The kitchen/dining/TV space had plenty of space and the kitchen had all the dishes/pots/pans we needed. We enjoyed the shuttle to take us to the beach every day and also enjoyed the pool very much. There are so many things to do there that we will very likely be back again. Amazing Grace is clean, well appointed and in a quiet cul-de-sac close to the shuttle and South Entrance of Currituck Club. The pool is larger than the picture revealed and wooded so it was quiet fun and private. Our friends stayed nearby and came over one evening, we had 14 on the back deck for a seafood cookout and there was space for everyone. Paramount Destinations has an easy to use ap and a realtor key box style access so there was no hassles checking in or out. Thank you for so many nice compliments about this home, Amazing Grace, and also the service you received from our staff at Paramount Destinations. So happy you loved the home and had a great vacation! Hope to see you back with us for many years to come! Loved the pool, spent every day in it. Only drawback was the huge number of spiders around the porches. Thank you for taking the time to submit a review of Amazing Grace and your time here with us in the Outer Banks. We do hope to see you back with us for many years to come! We were a group of 4 couples who met in college through a group called Campus Crusade for Christ and decided to vacation together. The home's name, Amazing Grace, and its layout worked for us! Three of the bedrooms were on the ground floor. One of the queen bedrooms had it's own bathroom, and the bunk room shared a bath with another queen room. We liked the layout of the shared bathroom! There was a door separating the sink area from the toilet and shower. It was easy to share the bathroom with four adults. The king bed and bath along with the kitchen and decent sized great room occupied the second floor. The kitchen was very roomy to cook in and we loved that we could all sit at the table for dinner together! We all enjoyed sitting around on comfortable leather furniture to talk and play games in the great room. The porch areas were great to hang out on, and the pool was relaxing after a long day at the beach! We took the trolley to the beach everyday. We can't speak highly enough about the Currituck Club employees who were so friendly and always picked us up in an extremely timely manner! We've never stayed in the Currituck Club before. Those of us who have stayed in OBX previously have stayed on the ocean side. 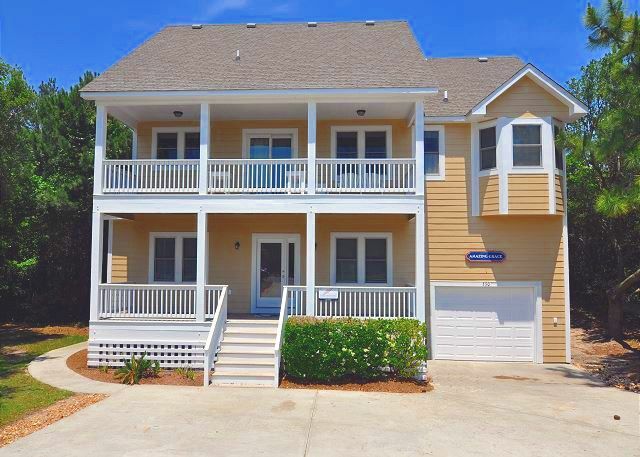 We LOVED staying in the Currituck Club community on the sound side! We will always look to see if Amazing Grace is available!! Thank you for this wonderful review of the Amazing Grace home, associates at The Currituck Club, etc. Reviews such as yours truly assist the next guest coming in, with such specific information about the home and surrounding area. We are happy you enjoyed your vacation time with us and we hope to see you again in 2018! Great family vacation. Enjoyed it! !